Microsoft Forms is a good tool for creating online surveys and quizzes. 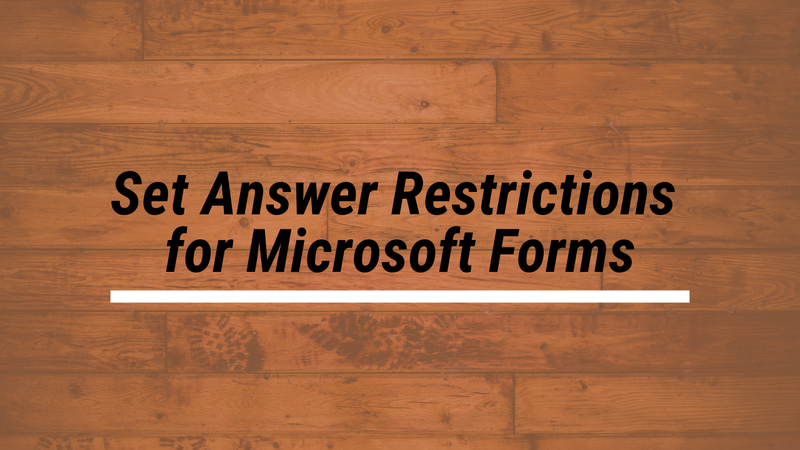 Setting answer restrictions is one of the overlooked features of Microsoft Forms. Creating answer restrictions allows you to specify the type of input that you'll accept in response to a question. As you can see in my new video, setting answer restrictions can be useful in making sure that your students enter numbers instead of words. In addition to being useful in ensuring that students enter numbers instead of words, using answer restrictions can be a good way to give students clues toward a correct answer on a form. For example, if the answer to a question is "25" you can set an answer restriction that is "greater than or equal to 20." Then if their answers are under 20 they will instantly know they're not correct because they won't be able to even submit the answer.